Gregory King is a 30 years old artist. Gregory lives in the intersection of spirituality and culture and creates works that inspires digression from fast food society and cultivates authenticity, mindfulness and the fulfillment of human potential. Errich Petersen has been a resident of Austin for 15 years and has a special place in his heart for East Austin. As an actor, photographer and filmmaker he has worked with various theatre companies and venues on the East side including The Vortex Repertory Company, City Theatre, The Off Center, Blue Theatre, Arts on Real and Yellow Tape Construction Company. It’s hard to drive around East Austin and not experience art. It’s everywhere. As I took pictures and talked to people I discovered a common theme about this part of town: It’s what we make of it. A lot of times we don’t have much control of what we’re given, but we do have control of what we do with it. Hopefully, this series will show the beauty and creativity of its residents. Longtime Austin-based photographer Brenda Ladd focuses on the faces, the community, the landscapes, and the culture of Austin and beyond. In the FACING EAST study, Brenda explores and illuminates meaningful vignettes of the East Austin community to reveal a landscape of love, respect, hope and community. Portrait artist, pinhole/fine photographer, naturalist, and educator, Brenda's images have been featured in many publications including: Texas Parks and Wildlife, The Pinhole Journal, Austin American Statesman, and the Nature Conservancy, among others. This series is titled "Getting Around East Austin" and is composed of candid photographs taken with a Nikon D3100 from 6 PM August 19 to 6 PM August 21, 2011. Each photo stands alone and tells its own story; some can be viewed in a larger metaphorical sense of East Austin's history, culture, and context; together at their simplest they illustrate a range of transport choices and usage found in East Austin. Except for bicycles, I didn't like any of the bicycle pictures I took. Individual faces are not visible, they are out of focus or turned away, as they stand in for residents on a broader scale. This particular weekend, the color turquoise kept appearing, in the sky and in manmade objects, and so is well represented in this series. Steven Polunsky's work is viewable on the Internet (http://polunsky.tumblr.com/ http://www.flickr.com/photos/polunsky/) and was most recently exhibited at the LBJ School of Public Affairs. He is employed by the Texas Senate Committee on Business & Commerce (Senator John Carona, Chair). He and his wife have two children. I continue my participation in “Facing East” with two cameras and two ideas of what I want to capture on the east side of Austin, Texas. With my old medium format YashicaMat and B&W film I set out to photograph a few of the people who were out and about early Saturday and Sunday morning. Using a twin-lens reflex camera requires patience in focusing and composing, giving the photographer the opportunity to interact with her subject. Although I am normally shy around strangers, the camera becomes my passport, a raison d’etre for being there; I forget about my shyness. Thus it was that I met Omar, homeless and hoping for political asylum from his home country of Somalia; long-haul truck driver Charles Carter; and church-goers Thomas and Sherry Hickman, who invited me to their home in Bastrop. The biggest surprise was the Cook sisters, ushers at their church. Michele was an intern at the Austin Chronicle when I was art director there; we hadn’t seen each other since 1991! Using my digital camera, I shot purely for form and color the striking compositions presented by the façades of older, abandoned structures, along with funky details and yard art in the area; these became the “Grid” compositions. 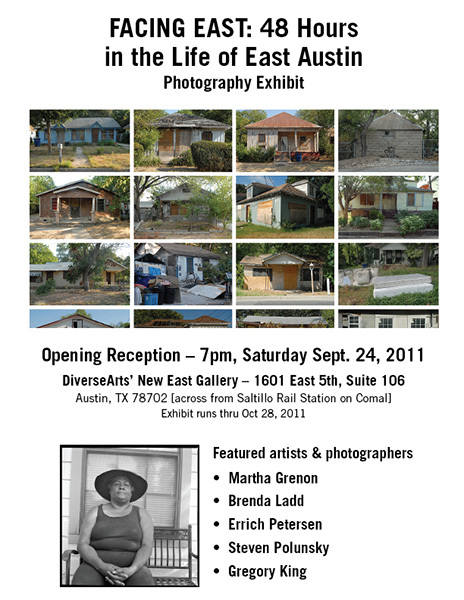 It is my hope that these series of photos portray in their small way two aspects of life and times in Central East Austin on August 20 and 21, 2011. I find the still life on the east side of Austin to be an art form in its own right. Having supported my photography habit as a graphic designer for years, I am always on the lookout for interesting arrangements of alphabet letters, symbols, shapes and diorama-like yard art, no matter what continent I’m on. For this year’s “Facing East” project I cruised the district early on Saturday and Sunday, first, because it’s the coolest part of the day, but also because the early morning sun casts more intense shadows. As well, at that time of day there are few people trying to get anywhere in a hurry, so my wandering at 15 MPH does not inconvenience anyone. It’s the living, moving people of the East Side that interest me most, because of the interaction between the subject and the photographer (who normally leads a solitary life). People are usually so astounded by the sight of my clunky old medium format film camera that they willingly agree to be photographed; the camera is my door-opener, my passport to another world. Although I have taken photographs since receiving a Brownie camera for my tenth Christmas, I didn’t think about being a photographer until much later in life; I had other fish to fry. In the early 1980s, caught up in the Austin music scene, I began taking black and white photos again, processing film and prints in various makeshift darkrooms. Eventually, I was able to set up a darkroom in my home. I think it was that, along with my first visit to Albania in 1992, that made me realize that this was, finally, what I really wanted to do with my life: Make pictures. The camera has become my license into other worlds and other people’s lives and my inquisitive nature jumped at the challenge of navigating terra incognita. Events in the Balkans went from bad to worse at a rapid rate and although I was unable to cover the wars, I return regularly to document the changes. My most recent project--"Minority Report"-- is concerned with the Roma (Gypsies) and their precarious position in the new world order. Essentially, I lead several lives, and making photographs has been my means of understanding and integrating these worlds, both here and abroad.